How do I prevent other users from seeing when I go online? How do I prevent other users from seeing when I go online? 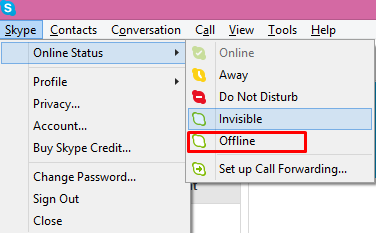 Although I set my Skype status to offline they still get informed that I am logging on. I need to change this. Can you help? Next, select Sign Out from the Skype drop-down list and then sign in. Now, the users shouldn't be able to see you logged in. If you still have problems, I recommend you contact Skype support team. How can I completely remove Skype?